BlueClaws Charities has released their annual Community Impact Report. LAKEWOOD, NJ - The Lakewood BlueClaws and BlueClaws Charities have released their 2018 Community Impact Report including information on BlueClaws Charities grant recipients and club community involvement throughout the year. "The BlueClaws and BlueClaws Charities are very proud of the extensive work that we do in the community throughout the year," said team President Joe Ricciutti. "This takes a buy-in from our entire staff, and we are looking forward to expanding this in 2019." To read the 2018 Community Impact Report, click here. BlueClaws Charities handed out cash grants to 39 Community Partners in 2019 and all organizations that applied received a grant. These organizations, ranging from local branches of national charities to smaller local organizations, each create a positive impact in the community in a different way. Said BlueClaws VP of Community Relations Jim DeAngelis: "These BlueClaws Charities Community Partner organizations are on the ground working with the underserved and underprivileged around the Jersey Shore and BlueClaws Charities is thrilled to support them and their great work with grants. Further, we are pleased to note that all grant money stays in Ocean and Monmouth Counties and is put to great use locally. We thank everyone that supported a BlueClaws Charities fundraising event to make these grants possible." Grant fundraising included special fundraising events, both in and outside the stadium, throughout the year. 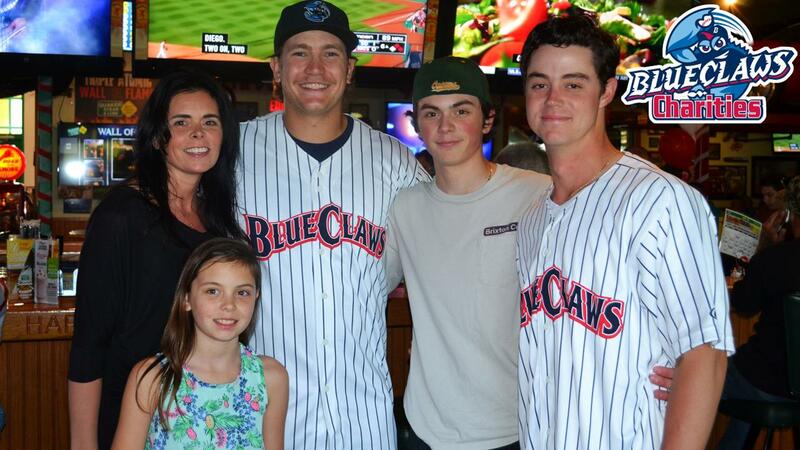 In May, the BlueClaws hosted their 18th annual ALS Celebrity Waiter Event, benefiting the ALS Association of Greater Philadelphia, the principal charity of the Phillies. This year's event was held at Quaker Steak & Lube in Brick. The Celebrity Waiter Event has raised over $100,000 for the ALS Association of Greater Philadelphia in its history. In August, BlueClaws Charities hosted their annual golf outing at Lakewood Country Club. The ninth annual event, a "Nine and Dine" format, includes golf, dinner, and special auctions plus appearances by BlueClaws players and coaches. Additional funding came from the nightly 50/50 raffle which took place at all BlueClaws home games. Each pool totaled over $2,500 on average with an average of more than $1,250 being returned to winners. BlueClaws Charities also raised money through BlueClaws jersey auctions during the year. In 2018, the BlueClaws did five jersey auctions - Bark in the Park, Grateful Dead, Star Wars, BruceClaws, and Seven Kingdoms of Claws, with plans to do additional jersey auctions in 2019. This year, fans were able to bid either online or through a mobile device, enabling bidding from all over the world. This process raised additional funds for BlueClaws Charities and their Community Partners. The BlueClaws and BlueClaws Charities partner with OceanFirst Bank and OceanFirst Foundation on several programs that benefit area military personnel. The Home Runs for Heroes program, which just completed its 10th year, generates a donation from OceanFirst Foundation to a local military-based non-profit for each BlueClaws home run hit at FirstEnergy Park. In 2018, the BlueClaws hit 46 home runs in Lakewood, the most in franchise history. Further, through the Vets Night Out program, presented by OceanFirst Bank, tickets are donated to military members through accredited channels. Additional events during the year included a Challenger Clinic at which the developmentally disabled were able to learn baseball from BlueClaws players and Major League alumni. Troop and School Supply Drives were held at the ballpark during games and the 19th annual Breakfast With Buster holiday food and toy drive was held in December, collecting non-perishable food and unwrapped toys to benefit the Salvation Army of Ocean County. Through the Phillies Step-Up Program, BlueClaws players participated in over 275 hours of community service during the year. This included events at the ballpark and around the community such as a free clinic put on by the Ocean County Parks Department featuring BlueClaws players. BlueClaws staff members served on event committees for 10 different area non-profit organizations and on the Board of Directors of six different non-profit organizations and four Chambers of Commerce. The BlueClaws fundraising program also proved profitable for area organizations and event committees. In 2018, over $130,000 was raised through the BlueClaws fundraising program, through which organizations purchase BlueClaws tickets and re-sell them to their constituents to raise money. An additional $34,501 was raised by organizations whose staffers volunteered in FirstEnergy Park concession stands during the season. For additional information on that program, contact a BlueClaws representative at 732-901-7000 option 3. BlueClaws Charities is the official 501c3 of the Lakewood BlueClaws. The organization supports its Community Partners in Monmouth and Ocean Counties with cash grants and other organizations with in-kind donations throughout the year. The Lakewood BlueClaws are the Jersey Shore's top stop for affordable, family entertainment. BlueClaws ticket packages and group outings are currently on sale by calling 732-901-7000 option 3 or online at BlueClaws.com. Opening Night of the 2019 season is on Thursday, April 4th.